Freemasonry is one of the world’s oldest secular fraternities. It is a society concered with moral and spiritual values. Freemasons are taught these precepts by a series of ancient forms, using the customs and tools of the stonemasons as allegorical guides. The essential qualification for admission to Freemasonry is a belief in a Supreme Being. Membership is open to men of integrity from any race or religion who can fulfil this essential qualification. Freemasonry is not a religion, or a combination of religions, nor is it a substitute for religion. It expects its members to adhere to their own faith, and it does not permit discussion on religious matters at Masonic meetings. Relief – Freemasons are taught to practise charity, and to care, not only for their own members, but for the community as a whole, by both charitable giving, and by voluntary effort. Freemasonry has been concerned from its earliest days with the care of orphans, the sick and the aged. This work continues today. Freemasonry demands that its members abide by the laws of the country in which they live and work. The principles of Freemasonry do not, in any way, conflict with the member’s duties as a citizen, but rather encourage and support its members in fulfilling their public and private responsibilities. The use of a Freemason of his membership to promote his business, professional or personal interests is forbidden. A Mason’s duty as a citizen must always prevail over any obligation to other Freemasons, and any attempt to shield a Freemason who has acted dishonourably or unlawfully is strictly forbidden. The only secrets of Freemasonry are those concerned with its traditional modes of recognition. It is not a Secret Society, as all its members are free to acknowledge their membership, and will do so in response to reasonable inquiries. There is no secret about any of the aims and principles, and its constitutions and rules are available to the public. Like many other societies, it regards some of its internal affairs as matters private to its members. Masonic meeting places are well known locally. Freemasonry is non-political, and any discussion of politics at Masonic meetings is forbidden. 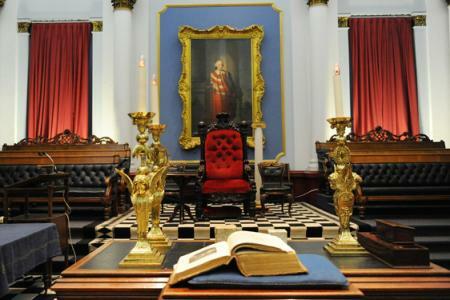 Freemasonry is practiced under many independent Grand Lodges with standards similar to those required by the Grand Lodge of Ireland. There are a few Grand Lodges and other self-styled Masonic or similar Bodies which do not meet these standards (e.g. which do not require belief in a Supreme Being, encourage their members to participate in political matters, etc.). These Bodies are not recognised by the Grand Lodge of Ireland. A Freemason is encouraged firstly to do his duty to his God through his faith and religious practice, and secondly to his neighbour through charity, tolerance and service. These ideas are not exclusively Masonic, but are universally acceptable, and Freemasons are expected to follow them.